Industrial Control Panels have long been the bridge between the operator interface and the field instrumentation devices. Industrial Control Panel design that is innovative and robust is of paramount to the success of your project. Manco designs cost-effective panels to minimize physical footprint while considering future expandability and integration with third party systems. Our panel design documentation package includes as-built documents for reference for the installer, operator and field technician. We utilize the highest international standards and leading edge technologies for all panel designs, allowing us to preview the panel layout at all stages of the design process and quickly and easily implement any changes. Manco has extremely skilled and experience technicians to build any CSA or cCSAus electrical control panels for your next project. 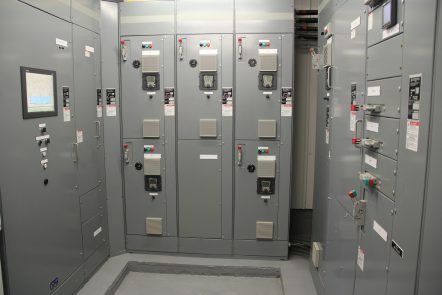 We provide the best practices in the industry to deliver your electrical control panels directly to your site; they are pretested and shipped to ensure reliable operation upon arrival. Manco is your best resource to provide your next custom MCC. Significant cost savings and an increased level of efficiency and quality can be achieved when Manco mounts and wires input/output racks, AV variable speed, and soft-starts into a standard MCC section. Historically, MCC OEM manufacturers have had difficulty responding to short lead-times on engineered MCC orders. Manco can solve this problem for you by ordering standard MCC sections (Class I) and performing the required modifications and testing. Depending on the size and complexity of the order, Manco can custom wire and ship your custom MCC order within 3-5 weeks. Manco provides innovative and cost-effective automation & control solutions to Original Equipment Manufacturers (OEMs). We are the manufacturers’ best resource to design, manufacture, and service custom control packages. Manco employs a very strict internal quality control process to ensure that our control panels fully meet your requirements. Manco visual inspections the components, wiring, labelling, and documentation to the orignal design drawings to ensure that the control panel meets your specifications. Manco has a team technicians to perform the necessary I/O checks and perform functional electrical testing on all units. Upon request, Manco can design and support custom test requirements and simulation testing for our clients.